Published on February 15, 2009 in packaging, product design and skin. 1 Comment Tags: Naoto Fukasawa. Naoto Fukasawa creates ‘Juice Skin’ and engages our full sensory perceptions at first glance. Fukasawa, one of the best known Japanese product designers, gets right to the heart of the message. Banana. Kiwi. Strawberry. The package he creates is the essence of the fruit itself, yet he still manages to twist our expectations. Subtle markings on the skin of the banana juice and the angles of the packaging evoke the sensation of holding an actual banana. 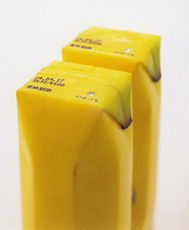 Naoto Fukasawa brings fruit, and packaging to life.